For this tennis player's detailed statistics, records, and other achievements, see Venus Williams career statistics. Venus Ebony Starr Williams (born June 17, 1980) is an American professional tennis player who is currently ranked world No. 49 in the WTA singles rankings. She is generally regarded as one of the all-time greats of women's tennis and, along with younger sister Serena Williams, is credited with ushering in a new era of power and athleticism on the women's professional tennis tour. Last updated on: March 10, 2019. Williams has been ranked world No. 1 by the Women's Tennis Association on three occasions, for a total of 11 weeks. She first reached the No. 1 ranking on February 25, 2002, the first African American woman to do so in the Open Era, and the second all time since Althea Gibson. Williams' seven Grand Slam singles titles are tied for 12th on the all-time list, and 8th on the Open Era list, more than any other active female player except Serena. She has reached 16 Grand Slam finals, most recently at Wimbledon in 2017. She has also won 14 Grand Slam Women's doubles titles, all with Serena; the pair is unbeaten in Grand Slam doubles finals. Williams also has two Mixed Doubles titles. Her five Wimbledon singles titles tie her with two other women for eighth place on the all-time list, but gives her sole possession of No. 4 on the Open Era List, trailing only the nine titles of Martina Navratilova and the seven of Serena and Steffi Graf. From the 2000 Wimbledon Championships to the 2001 US Open, Williams won four of the six Grand Slam singles tournaments in that span. At the 2018 US Open, Williams extended her record as the all-time leader, male or female, in Grand Slams played, with 80. With her run to the 2017 Wimbledon singles final, she broke the record for longest time between first and most recent grand slam singles finals appearances. Williams has won four Olympic gold medals, one in singles and three in women's doubles, along with a silver medal in mixed doubles, pulling even with Kathleen McKane Godfree for the most Olympic medals won by a male or female tennis player. She is the only tennis player to have won a medal at four Olympic Games. At the 2000 Sydney Olympics, Williams became only the second player to win Olympic gold medals in both singles and doubles at the same Olympic Games, after Helen Wills Moody in 1924. With 49 singles titles, Williams trails only Serena among active players on the WTA Tour with most singles titles. Her 35-match winning streak from the 2000 Wimbledon Championships to the 2000 Generali Ladies Linz tournament final is the longest since January 1, 2000. She is also one of only three active WTA players to have reached the finals of all four Grand Slams, along with Serena and Maria Sharapova. Williams was born in Lynwood, California, to Richard Williams and Oracene Price. Her talents were apparent at the age of seven when a professional local tennis player named Tony Chesta spotted Williams and quickly identified the talent. The Williams family moved from Compton, California, to West Palm Beach, Florida, when she was ten, so that Venus and Serena could attend the tennis academy of Rick Macci, who took notice of the sisters and who would provide additional coaching. He did not always agree with Williams's father but respected that "he treated his daughters like kids, allowed them to be little girls". Richard stopped sending his daughters to national junior tennis tournaments when Williams was eleven, since he wanted them to take it slow and focus on schoolwork. Another motivation was racial, as he had allegedly heard parents of other players disparage the Williams sisters during tournaments. At that time, Williams held a 63–0 record on the United States Tennis Association junior tour and was ranked No. 1 among the under-12 players in Southern California. In 1995, Richard pulled his daughters out of Macci's academy, and from then on took over all coaching at their home. Williams is a very powerful baseliner who also has an attacking all-court game. Her game is well adapted to grass, where she feels most comfortable, which is reflected in her five Wimbledon singles titles. She has developed into a skilful volleyer who uses her long arm span (1.85m) and agility around the net. Williams also has great court coverage and can hit winners from a defensive position. Williams holds the record for fastest serve in three of the four Grand Slam tournaments: 2007 French Open second round, 2008 Wimbledon final, 2007 U.S. Open first round – 129 mph (208 km/h). Williams turned professional on October 31, 1994, at the age of fourteen. In the second round of her first professional tournament, the Bank of the West Classic in Oakland, Williams was up a set and a service break against world No. 2 Arantxa Sánchez Vicario before losing the match. That was the only tournament Williams played in 1994. In 1995, Williams played three more events as a wild card, falling in the first round of the tournament in Los Angeles and the tournament in Toronto but reaching the quarterfinals of the tournament in Oakland, defeating No. 18 Amy Frazier in the second round for her first win over a top 20 ranked player before losing to Magdalena Maleeva. Williams played five events in 1996, falling in the first round four times but reaching the third round in Los Angeles, before losing to No. 1 Steffi Graf. In her debut at the Australian Open, Williams defeated younger sister Serena in the second round, which was the sisters' first professional meeting. Williams eventually lost in the quarterfinals to No. 3 Davenport. Three weeks later, Williams defeated No. 2 Davenport for the first time in the semifinals of the IGA Tennis Classic in Oklahoma City. Williams then defeated Joannette Kruger in the final to win the first singles title of her career. In her first Tier I event of the year, Williams lost in the semifinals of the State Farm Evert Cup in Indian Wells to No. 1 Hingis. The following week, Williams won the Tier I Lipton International Players Championships in Key Biscayne, Florida, defeating No. 1 Hingis in the semifinals. On March 30, 1998, her ranking broke into the top 10 for the first time, at No. 10. Williams played only one tournament on clay before the 1998 French Open. At the Italian Open in Rome, she defeated sister Serena in the quarterfinals and No. 5 Sánchez Vicario in the semifinals before losing to No. 1 Hingis in the final. Williams lost again to Hingis in the quarterfinals of the French Open. Williams lost her first match at the Direct Line International Championships in Eastbourne on grass before losing to No. 3 and eventual champion Jana Novotná in the quarterfinals of Wimbledon. On July 27, 1998, her ranking rose to No. 5. Williams played three tournaments during the North American 1998 summer hard court season. She reached her fifth final of the year at the Bank of the West Classic in Stanford, California, defeating No. 6 Monica Seles in the semifinals before losing to No. 1 Davenport. Patellar tendonitis in her left knee caused her to retire from her quarterfinal match at the tournament in San Diego while trailing Mary Pierce 4–0 in the third set. At the US Open, Williams defeated fourth-seeded Sánchez Vicario in the quarterfinals before losing to second seeded and eventual champion Davenport in the semifinals. Williams played four tournaments in the remainder of 1998. She won her third title of the year at the Grand Slam Cup in Munich in September, defeating No. 9 Patty Schnyder in the final. She lost in the second round of the Porsche Tennis Grand Prix in Filderstadt before losing in the final of the Tier I Swisscom Challenge in Zürich to No. 1 Davenport and the semifinals of the Tier I Kremlin Cup in Moscow to Pierce. She had earned enough points during the year to participate in the year-ending Chase Championship but withdrew from the tournament because of tendonitis in her knee. She finished the year ranked No. 5. In 1998, Williams teamed with Justin Gimelstob to win the mixed doubles titles at the Australian Open and the French Open. Her sister Serena won the other two Grand Slam mixed doubles titles that year, completing a "Williams Family Mixed Doubles Grand Slam". Williams won the first two women's doubles titles of her career, in Oklahoma City and Zürich. Both titles came with sister Serena, becoming only the third pair of sisters to win a WTA tour doubles title. Williams started the 1999 tour in Australia, where she lost to No. 10 Steffi Graf in the quarterfinals of the Medibank International in Sydney and No. 1 Davenport in the quarterfinals of the Australian Open. However, she rebounded at the Faber Grand Prix in Hanover, defeating Graf for the first time in the semifinals before losing the final to No. 3 Novotná. Williams then successfully defended her titles in both Oklahoma City and Key Biscayne. She defeated Novotná and Graf to reach the final in Key Biscayne, where she defeated Serena in three sets in the first final on the WTA Tour to be contested by two sisters. Williams played four clay court events during the spring. She lost her first match at the Bausch & Lomb Championships in Amelia Island, Florida. Three weeks later, however, she won her first title on clay at the Betty Barclay Cup in Hamburg, defeating Mary Pierce in the final. 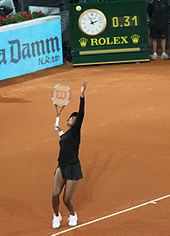 Williams then won the Tier I Italian Open in Rome, defeating No. 1 Hingis in the semifinals and No. 8 Pierce in the final. At the French Open, she extended her winning streak to 22 matches before losing in the fourth round to No. 125 Barbara Schwartz. Williams teamed with Serena to win the women's doubles title at this event, the first Grand Slam title the pair won together. At the 1999 Wimbledon Championships, Williams defeated No. 17 Anna Kournikova in the fourth round to reach the quarterfinals for the second consecutive year, where she lost to eventual runner-up Graf. Williams rebounded in the summer when she won two Fed Cup matches against Italy and lost in the final of the Bank of the West Classic in Stanford to No. 1 Davenport. One week later, Williams defeated Davenport in the semifinals of the TIG Tennis Classic in San Diego before losing to No. 2 Hingis in the final. In her last tournament before the US Open, Williams won the Pilot Pen Tennis in New Haven, Connecticut, defeating No. 5 Seles in the semifinals and Davenport in the final. On August 30, 1999, her world ranking reached third for the first time. Seeded third at the US Open, Williams lost in the semifinals to No. 1 Hingis in three sets. However, she teamed with singles champion Serena at this event to win their second Grand Slam women's doubles title. During the remainder of the year, Williams contributed to the USA's victory over Russia in the Fed Cup final, winning one singles rubber before joining Serena to win the doubles rubber. At the Grand Slam Cup in Munich, Williams defeated Hingis in the semifinals before losing to Serena for the first time in the final. Williams won her sixth title of the year at the Tier I event in Zurich, defeating No. 1 Hingis in the final. Four weeks later, she lost to Davenport in the semifinals of the tournament in Philadelphia. Making her debut at the year-ending Chase Championships, Williams lost to Hingis in the semifinals. She finished the year ranked No. 3. In 2000, Williams missed the first five months of the year with tendinitis in both wrists. She returned to the tour during the European clay court season. She lost in the quarterfinals of the Betty Barclay Cup in Hamburg to Amanda Coetzer and in the third round of the Tier I Italian Open in Rome to Jelena Dokić. Although she had won only two of her four matches before the French Open, she was seeded fourth there. She won her first four matches in Paris without losing a set before losing in the quarterfinals to eighth-seeded and former champion Arantxa Sánchez Vicario in three sets. Williams then won 35 consecutive singles matches and six tournaments. She won her first Grand Slam singles title at Wimbledon, defeating No. 1 Martina Hingis in the quarterfinals, sister Serena in the semifinals, and defending champion Lindsay Davenport in the final. She also teamed with Serena to win the women's doubles title at this event. She won three Tier II events during the North American summer hard court season, defeating Davenport in the final of the Bank of the West Classic in Stanford and Monica Seles in the finals of both the Acura Classic in San Diego and the Pilot Pen Tennis championships in New Haven. At the US Open, Williams defeated No. 1 Hingis in the semifinals and No. 2 Davenport in the final. At the Olympic Games in Sydney, she defeated Sánchez Vicario in the quarterfinals, Seles in the semifinals, and Elena Dementieva in the final to win the gold medal. She also won the gold medal in women's doubles with her sister Serena. Davenport eventually snapped her winning streak in October in the final of the Linz Open. Williams did not play a tournament the rest of the year because of anemia. She finished the year ranked No. 3 and with six singles titles. In 2001, Williams reached the semifinals of the Australian Open for the first time, where she lost to No. 1 Hingis. However, Williams teamed with her sister Serena to win the doubles title at the event, completing a Career Golden Slam in women's doubles for the pair. Williams also reached the semifinals of the Tier I Tennis Masters Series tournament in Indian Wells, California, where she controversially defaulted her match with sister Serena just before the match started. Williams had been suffering from knee tendinitis throughout the tournament and eventually this prevented her from playing. The following day, Williams and her father Richard were booed as they made their way to their seats to watch the final. Serena was subsequently booed during the final with Kim Clijsters and during the trophy presentation. Due to this, neither Williams sister entered the tournament for 14 years, with Serena entering in 2015 after appeals for forgiveness from the event and the WTA Tour. Williams rebounded from the Indian Wells 'boycott' controversy to win the next tournament on the tour calendar, the Tier I Ericsson Open in Key Biscayne, Florida. She defeated Hingis in the semifinals and No. 4 Jennifer Capriati in the final, after saving eight championship points. Because of this victory, her ranking rose to a career high of No. 2. 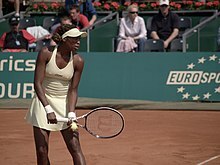 During the European clay court season, Williams won the Tier II tournament in Hamburg but lost in the third round of the Tier I EUROCARD Ladies German Open to No. 18 Justine Henin and the first round of the French Open to Barbara Schett. This was only the second time that she had lost in the first round of a Grand Slam singles tournament. Williams then successfully defended her Wimbledon title, defeating third-seeded Davenport in the semifinals and eighth-seeded Henin in three sets in Henin's first Wimbledon final. During the North American summer hard court season, Williams won for the second consecutive year the tournaments in San Diego, defeating Seles in the final, and in New Haven, defeating Davenport in the final. Williams also won the US Open singles title for the second consecutive year, without dropping a set. In the quarterfinals, she beat fifth-seeded Clijsters, followed by a semifinal victory over No. 2 Capriati. She played Serena in the final, which was the first Grand Slam singles final contested by two sisters during the open era. Venus won the match and her fourth Grand Slam singles title. Williams also became only the sixth woman in history to win the singles titles at both Wimbledon and the US Open in consecutive years, the others being Martina Navratilova (twice), Steffi Graf (twice), Althea Gibson, Maureen Connolly Brinker, and Helen Wills Moody (twice). Williams started 2003 by defeating fifth seed Justine Henin to make the final of the Australian Open for the first time. In the final, however, she lost to sister Serena. This marked the first time in the open era that the same two players had met in four consecutive Grand Slam finals. Venus and Serena teamed to win the women's doubles title at the event, their sixth Grand Slam title in women's doubles. In February, Williams won the Proximus Diamond Games in Antwerp, Belgium for the second consecutive year, defeating Kim Clijsters in the final. However, shortly afterwards, she began to struggle with injury. She reached the final of the clay-court J&S Cup in Warsaw, before being forced to retire against Amélie Mauresmo. She then suffered her earliest exit at a Grand Slam tournament in two years when she lost in the fourth round of the French Open to Vera Zvonareva. At Wimbledon, Williams was seeded fourth. Williams defeated former champion Lindsay Davenport in the quarterfinals and Kim Clijsters in the semifinals to advance to her fourth consecutive Wimbledon final, where she lost again to sister Serena. Wimbledon was Williams's last event of the year as an abdominal injury that occurred during the Clijsters match prevented her from playing again. While she was recovering from the injury, her sister Yetunde Price was murdered. Williams finished the year ranked No. 11. It was the first time in nearly six years that she had dropped out of the top 10. In 2004, Williams came back to the tour suffering inconsistent results. As the third seed because of a protected ranking, she reached the third round of the Australian Open, where she lost to Lisa Raymond. She then lost in the quarterfinals of her next three tournaments. Williams began to find her form at the beginning of the clay-court season. At the Tier I Family Circle Cup in Charleston, South Carolina, Williams defeated Conchita Martínez in the final to win her first title in over a year and the second Tier I title on clay of her career. She then won in Warsaw, defeating Svetlana Kuznetsova in the final, before reaching the final of the Tier I German Open in Berlin. She then withdrew from that match against Mauresmo due to injury. Going into the French Open, Williams had the best clay-court record among the women and was among the favorites to win the title; however, after making the quarterfinals to extend her winning streak on the surface to 19 matches, she lost to eventual champion Anastasia Myskina. Despite her defeat, she re-entered the top 10. At Wimbledon, Williams lost a controversial second-round match to Croatian Karolina Šprem. The umpire of the match, Ted Watts, awarded Šprem an unearned point in the second-set tiebreak. Upon the conclusion of the match, he was relieved of his duties. This defeat marked the first time since 1997 that Williams had exited Wimbledon prior to the quarterfinals. After Wimbledon, Williams reached her fourth final of the year at the Bank of the West Classic in Stanford, California, where she was beaten by Lindsay Davenport for the first time since 2000. As the defending champion at the Athens Olympics, Williams lost in the third round to Mary Pierce. She then won three very close matches against Petra Mandula, Shikha Uberoi and Chanda Rubin to make the fourth round of the US Open where she lost to Davenport, the first time she had ever lost at the US Open prior to the semifinals. Williams completed the year by losing in the quarterfinals of three indoor tournaments in the fall, a period that included defeat in her first meeting with 17-year-old Wimbledon champion Maria Sharapova at the Zurich Open. Williams finished the year as No. 9 and did not qualify for the year-ending WTA Tour Championships. In 2005, Williams started the year by losing in the fourth round of the Australian Open to Alicia Molik. She then reached the final in Antwerp, defeating Clijsters and Myskina en route. In the final, Williams was a set and a service break up against Mauresmo before eventually losing. In March, at the NASDAQ-100 Open in Miami, Williams defeated sister and Australian Open champion Serena in the quarterfinals, the first time she had defeated Serena since 2001. Williams went on to lose in the semifinals to No. 3 Sharapova. In May, Williams won her first title in over a year at the clay-courts at the İstanbul Cup, defeating Nicole Vaidišová in the final. However, at the French Open, she lost in the third round to 15-year-old Sesil Karatantcheva, who subsequently tested positive for steroids and was suspended. Williams was seeded 14th at Wimbledon. In the quarterfinals of the tournament, she defeated French Open runner-up Pierce in a second-set tiebreak, winning it 12–10 to make the semifinals of a Grand Slam for the first time in two years. There, she defeated defending champion and second-seeded Maria Sharapova to make the Wimbledon final for the fifth time in six years. Playing top-seeded Davenport in the final, Williams saved a match point with a backhand winner en route to winning. This was Williams's third Wimbledon singles title, her fifth Grand Slam singles title overall and her first since 2001. It was the first time in 70 years that a player had won after being down match point during the women's final at Wimbledon. In addition, Williams was the lowest-ranked (No. 16) and lowest-seeded (14th) champion in tournament history. Williams returned to the top 10 following the victory. Following Wimbledon, Williams reached her fourth final of the year in Stanford, where she lost to Clijsters. At the US Open, Williams achieved her second consecutive win over Serena in the fourth round, but then lost in the quarterfinals to eventual champion Kim Clijsters. Williams did not qualify for the year-ending Sony Ericsson Championships because of an injury sustained during the tournament in Beijing. She finished the year ranked No. 10. It was the first year since 2001 that she had finished a year ranked higher than Serena. In 2006, Williams was upset in the first round of the Australian Open by Tsvetana Pironkova, which was her earliest loss ever at that tournament. After that loss, she did not play again for three months due to a wrist injury. She returned in late April on clay in Warsaw, where she defeated former No. 1 Martina Hingis in the second round, before losing to Svetlana Kuznetsova in the quarterfinals. Williams completed the clay-court season by reaching the quarterfinals of the French Open, where she lost to Nicole Vaidišová. Williams was the defending champion and one of the favorites to win the singles title at Wimbledon. However, she lost in the third round to 26th-seeded Jelena Janković. After the loss, Williams said that she was having pain in her left wrist, although she admitted that the injury was not the cause of her loss. Williams did not play in the US Open series or the US Open itself due to the wrist injury. In October, during her first tournament in almost three months, she reinjured her wrist at the tournament in Luxembourg and lost in the second round to qualifier Agnieszka Radwańska. Williams finished the season as No. 46, her lowest finish since she began to play on the WTA Tour full-time in 1997. It was the second consecutive year she finished higher than Serena, who finished the year at No. 95. Williams withdrew from the 2007 Australian Open, the second consecutive Grand Slam that she had missed due to her recurring wrist injury. She returned in February at the Cellular South Cup in Memphis, USA, defeating top-seeded Shahar Pe'er in the final, her first singles title since her victory at Wimbledon in 2005. At the beginning of the clay-court season, Williams reached the semifinals of the Tier I Family Circle Cup in Charleston, South Carolina, where she lost to Jelena Janković on a third set tiebreak. She also lost to fourth seed Janković in the third round of the French Open, her third consecutive loss to Janković. During her second round win over Ashley Harkleroad, Williams hit a 206 km/h (128 mph) serve, which was the second fastest woman's serve ever recorded and the fastest ever recorded during a main draw match at the time. Williams was ranked No. 31 going into Wimbledon and was seeded 23rd at the tournament due to her previous results at Wimbledon. Williams was a game away from defeat in her first round match against Alla Kudryavtseva and in her third round match against Akiko Morigami she was two points away from defeat, but she eventually won both 7–5 in the third set. She then advanced to reach her sixth Wimbledon final, after beating Maria Sharapova, Svetlana Kuznetsova and Ana Ivanovic in straight sets en route, where she defeated 18th seed Marion Bartoli also in straight sets. Williams thus became only the fourth woman in the open era to win Wimbledon at least four times, along with Billie Jean King, Martina Navratilova and Steffi Graf. She also became the lowest-seeded Wimbledon champion in history, breaking the record she herself set in 2005. Williams returned to the top 20 as a result of the win. At the US Open, after setting a Grand-Slam record 129 mph (208 km/h) serve in the opening round, Williams advanced to her first Grand Slam semifinal outside of Wimbledon since 2003. However, she then lost to eventual champion Justine Henin. The tournament resulted in Williams's ranking moving up to No. 9. Williams then won her third title of the year at the Hansol Korea Open Tennis Championships in Seoul, South Korea, defeating Maria Kirilenko in the final, before then losing in the final of the Japan Open Tennis Championships in Tokyo to Virginie Razzano. Williams had earned enough points during the year to qualify for the year-ending WTA Tour Championships in Madrid; however, she withdrew because of continuing problems with anemia. Williams finished the year as No. 8 with three titles, her best performance in both respects since 2002, and a winning percentage of 83 percent. In 2008, as the eighth seed at the Australian Open, Williams reached the quarterfinals for the first time since 2003. However, she then lost to eventual runner-up Ana Ivanovic. Williams made her first semifinal of the year at the Bangalore Open in Bangalore, India, where she met sister Serena for the first time since 2005 with Serena winning despite Williams holding a match point in the third set tie break. Williams missed two tournaments at the beginning of the clay-court season due to undisclosed medical problems. At the French Open, Williams was seeded eighth but was eliminated by 26th-seeded Italian Flavia Pennetta in the third round. Williams was the defending champion and seventh-seeded player at Wimbledon. Without dropping a set, she reached her seventh Wimbledon singles final. She then won her fifth Wimbledon singles title, and seventh Grand Slam singles title overall, by beating sister Serena in straight sets. This was the first time since 2003 that Venus and Serena had played each other in a Grand Slam final and was the first time since 2001 that Venus had defeated her in a Grand Slam final. Venus and Serena then teamed to win the women's doubles title, their first Grand Slam doubles title together since 2003. Williams lost in the quarterfinals of the Beijing Olympics to Li Na. She did, however, earn a gold medal along with Serena in women's doubles, their second gold medal as a team, having won together at the Sydney Olympics in 2000. At the US Open, Williams was playing some of her best tennis since dominating the circuit in 2003, However, she was defeated in two tiebreaks by Serena (the eventual tournament winner) in a close quarterfinal match, after Williams had led 5–3 in both sets. At the Porsche Tennis Grand Prix in Stuttgart, Germany in October, Williams defeated a player ranked in the top three for the first time that season by defeating No. 3 Dinara Safina to reach her third semifinal of the year. There, she lost to Janković. A fortnight later, Williams won the Zurich Open, defeating Ivanovic in the semifinals before defeating Pennetta in the final to claim her second title of the year and secure a position in the year-ending 2008 WTA Tour Championships in Doha, Qatar. There, Williams defeated No. 2 Safina, No. 3 Serena and No. 5 Dementieva in the preliminary round-robin stage. In the semifinals, Williams defeated No. 1 Janković before winning the year-ending tournament for the first time by defeating Vera Zvonareva in the final. She ended the year ranked No. 6 with three titles and a winning percentage of 78 percent. As the sixth seed at the 2009 Australian Open, Williams lost in the second round to Carla Suárez Navarro after holding a match point in the third set. However, she teamed up with Serena to win the women's doubles title at the event, their eighth Grand Slam doubles title together. Williams rebounded in singles play in February at the Premier 5 (formerly Tier I) Dubai Tennis Championships, defeating defending champion and No. 4 Dementieva in the quarterfinals and No. 1 Serena in the semifinals on a third set tiebreak. The latter win meant that Williams led the head-to-head in career matches with her sister for the first time since 2002. Williams went on to defeat Virginie Razzano in the final. This win meant Williams was ranked in the top five for the first time since 2003, while it also marked her 40th professional singles title, only the twelfth player in the open era to achieve the feat. Williams won another title the following week at the Abierto Mexicano Telcel in Acapulco, Mexico, defeating Pennetta in the final. This was her first title on clay since 2005. 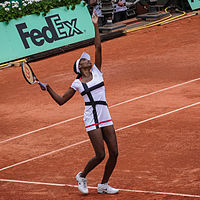 On European clay, Williams reached the semifinals in Rome before losing to No. 1 Safina. This run meant Williams was ranked in the top three for the first time since 2003. Seeded third at the French Open, Williams lost to Ágnes Szávay in the third round, the third consecutive year she had exited at that stage. Williams was seeded third at Wimbledon. She advanced to her eighth Wimbledon final, at which point she had won 34 straight sets (held since Wimbledon 2007). In the final, however, she lost the first set tie-break, and from then on lost in two sets to sister Serena. The Williams sisters teamed up to win the doubles title at the tournament for the fourth time. In Stanford, Williams defeated Maria Sharapova and Elena Dementieva to advance to the finals, where she would lose to Marion Bartoli. Teaming with her sister, she played doubles and won the title, defeating Monica Niculescu and Yung-Jan Chan. At the 2009 US Open, as the third seed, Williams made it to the fourth round before losing to Kim Clijsters in three sets. Williams then teamed up with Serena to play doubles at the open, where they won the title over defending champions and No. 1s in doubles, Cara Black and Liezel Huber, claiming their third grand slam doubles title in 2009. Williams's last tournament in 2009 was the year-ending Sony Ericsson Championships, where she was the defending champion in singles. She was in the maroon group which includes her sister Serena, along with Elena Dementieva and Svetlana Kuznetsova. She lost her first match against Dementieva, and her second match against Serena- both in straight sets, after taking the first set. In her third and final RR match, Williams defeated Svetlana Kuznetsova. Because of Dementieva's loss to Kuznetsova in their round robin match, Williams advanced to the semifinal of the championships. In her semifinal match, she defeated Jelena Janković of Serbia to advance to her second consecutive final in the tournament. In the final, she lost to her sister Serena. In doubles, Williams teamed with Serena as the second seeds. However, they lost to Nuria Llagostera Vives and María José Martínez Sánchez in the semifinal. Their doubles record at the end of the year stood at 24–2. Williams finished 2009 ranked No. 6 in singles (with a winning percentage of 70 percent) and No. 3 in doubles with Serena, in spite of them playing only six events together that year. Williams played at the Australian Open as the sixth seed. She defeated 17th-seeded Francesca Schiavone in the fourth round. She was two points from defeating 16th-seeded Li Na in the quarterfinals before losing in three sets. In doubles, she teamed with her sister Serena to successfully defend their title, defeating the top-ranked team of Cara Black and Liezel Huber in the final. She went onto the clay at the Abierto Mexico Telcel in Acapulco, where she was the defending champion. She reached the semifinals after recovering from a 1–5 third set deficit to Laura Pous Tió in the quarterfinals. In the final, she defeated first-time finalist Polona Hercog from Slovenia. This was her 43rd career title, the most among active female players. Her next tournament was the Premier Mandatory Sony Ericsson Open in Key Biscayne, where she was seeded third. She defeated No. 9 Agnieszka Radwańska in the quarterfinals and No. 13 Marion Bartoli in the semifinals to reach her third straight WTA tour final and fourth Sony Ericsson Open final. She was defeated by Kim Clijsters in the final in just 58 minutes, ending her 15-match winning streak. By reaching the final, her ranking improved to No. 4 and she crossed the $26 million mark in career prize money, the only player besides Serena to do so. The knee injury that hampered her during the final of the Sony Ericsson Open forced her to skip the Fed Cup tie against Russia and the Porsche Tennis Grand Prix in Stuttgart. Williams returned to the tour at the Premier 5 Internazionali BNL d'Italia in Rome. She suffered the worst defeat of her career in the quarterfinals, losing to No. 4 Jelena Janković 6–0, 6–1. Despite this loss, Williams's ranking improved to No. 3 on May 10. Her next tournament was the Madrid Open, a Premier Mandatory tournament. She lost to Aravane Rezaï in the final. In doubles, she teamed with Serena to win the title. On May 17, her ranking improved to No. 2, behind only Serena. This was the fourth time that the William sisters have occupied the top two spots, and the first time since May 2003. Her next tournament was the French Open, where she played both singles and doubles despite her knee injury. Seeded second in singles, she advanced past the third round at this tournament for the first time since 2006 before losing to Nadia Petrova in the round of 16. She also played doubles with Serena as the top seeds. Their defeat of Huber and Anabel Medina Garrigues in the semifinals increased their doubles ranking to No. 1. They then defeated 12th seeded Květa Peschke and Katarina Srebotnik in the final to win their fourth consecutive Grand Slam women's doubles title. By virtue of reaching the No. 1-ranking in doubles on June 7, 2010, Venus and Serena became just the 6th and 7th women to reach the No. 1 ranking in both singles and doubles following in the footsteps of Martina Navratilova, Arantxa Sánchez Vicario, Martina Hingis, Lindsay Davenport, and Kim Clijsters. Her next tournament was the Wimbledon Championships, where she had reached the final the previous three years. Despite her knee injury, she made it to the quarterfinals, where she lost to Tsvetana Pironkova. Pironkova was ranked No. 82 and had never gone past the second round of a Grand Slam event. As a result, Williams dropped to No. 4. She was the defending champion in doubles with her sister Serena, having won the tournament in the previous two years. However, they lost this time in the quarterfinals to Elena Vesnina and Vera Zvonareva. Williams then missed all tournaments in the US Open Series because of a left knee injury but still participated at the US Open as the third seed. She won three matches to move into the fourth round. Williams became one of only two women in 2010 (along with Caroline Wozniacki) to reach at least the fourth round at all four Grand Slam singles tournaments. Williams then defeated Pe'er and French Open champion Schiavone en route to her eighth US Open semifinal, against defending champion Clijsters. Williams won the first set of their match and recovered from 5–2 down in the second set but ultimately double-faulted on a key point near the end of the match and lost in three sets. Because of Serena's withdrawal from the US Open, Williams did not participate at the doubles event, where she was the defending champion. The recovery of her left knee took longer than expected and it forced her to miss the rest of 2010, including the year-ending Sony Ericsson Championships and Fed Cup final. Williams ended the year ranked fifth in singles, the first time she ended a year in the top five since 2002, while playing only nine tournaments. She finished the year ranked eleventh in doubles. Williams began the year at the final edition of Hong Kong Tennis Classic exhibition event. She lost both her singles matches against Vera Zvonareva and Li Na, but she helped Team America to win the silver group. At the Australian Open, Williams retired in the second game of her third round match against Andrea Petkovic after sustaining a hip muscle injury in her second round. This was Williams's first retirement during a match in a Grand Slam tournament since 1994 and thus ended her record of most Grand Slam matches without ever retiring, with 250 consecutive matches. This was also her first retirement from a match since LA Women's Tennis Championships in Los Angeles in 2004, ending her 294 consecutive matches without retiring. The injury forced Williams to pull out of the Fed Cup quarterfinal against Belgium, the Dubai Tennis Championships, and the Mexican Open, where she was the two-time defending champion in both tournaments. She subsequently withdrew from the Miami Open causing her ranking to drop to number fifteen. She also missed the clay court season which caused her ranking to drop to number twenty-nine. Her absence from the French Open marked the first Grand Slam tournament since the 2003 US Open where neither of the Williams sisters were competing. Williams then made her first appearance since the Australian Open in Eastbourne. Unseeded, she lost for the first time in eleven meetings to Daniela Hantuchová in the quarterfinals. She was seeded 23rd at the 2011 Wimbledon Championships. She played for nearly three hours in her second round match against Japanese veteran Kimiko Date-Krumm, winning in three tough sets. She then defeated Spaniard María José Martínez Sánchez in the third round, but was defeated by Bulgarian 32nd seed Tsvetana Pironkova in the fourth round. 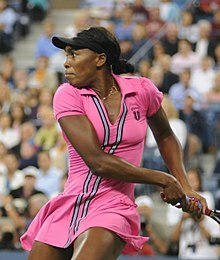 Originally scheduled to participate in the 2011 Rogers Cup in Toronto and the 2011 Western & Southern Open in Cincinnati, Williams withdrew due to viral illness. Her next scheduled tournament was the US Open. Unseeded at the US Open, Williams defeated Vesna Dolonts in the first round. She was scheduled to meet 22nd seed Sabine Lisicki in the second round, but withdrew before the match began after being diagnosed with Sjögren's syndrome, an autoimmune disease which causes fatigue and muscle and joint pain. This was the first time in her career that she did not reach the quarterfinals or better in any of the Grand Slam tournaments in a season. As a result, her ranking dropped to one-hundred and five. Williams did not play for the rest of the year at a competitive level; she appeared in three exhibitions tournaments in November and early December. She played against sister Serena in Colombia, which she won in straight sets. The week later, the sisters appeared in Milan, Italy to play exhibition against Italian duo Francesca Schiavone and Flavia Pennetta. Williams lost both her singles tie-break matches but won the doubles pairing with her sister. Williams played her third exhibition tournament in Barbados where she lost to Victoria Azarenka. She ended the year ranked No. 102. This was her first year-end finish ranked outside of the top 50 since 1997. Williams was scheduled to play in Auckland in preparation for the Australian Open. but withdrew from both tournaments due to health problems, announcing that she would return to the WTA tour in February. This dropped her ranking to No. 135. In February, Williams returned to competition in the doubles match of the Fed Cup World Group II tie between USA and Belarus. Playing with Liezel Huber, she won the dead-rubber in straight sets. Williams was granted wildcards to participate in the Miami and Charleston tournaments. In the first round of Miami — her first singles match since the 2011 US Open — Williams defeated Japanese veteran Kimiko Date-Krumm in straight sets. In the second round, she defeated No. 3 Petra Kvitová, her first top-3 victory since beating Svetlana Kuznetsova in 2009. In the third round, she saved a match point and defeated Aleksandra Wozniak in a three-set tiebreaker that ended a nearly three-hour match. In the round of 16, she bested No. 15 Ana Ivanovic in three sets to reach the quarterfinals, where she lost to the eventual champion, Agnieszka Radwańska in straight sets. Her run improved her ranking to number 87. A week later in Charleston, she reached her second consecutive quarterfinal, where she lost in three sets to Samantha Stosur. Williams at the 2012 French Open. Williams was granted wildcards to participate in Madrid and Rome. In Madrid, she lost in the second round to Angelique Kerber, but still improved her ranking to No. 63. A week later in Rome, she reached her third quarterfinal of the four tournaments she had participated in with a straight-sets victory against Samantha Stosur in the third round. She lost in the quarterfinals in straight sets to the No. 2, defending and eventual champion Maria Sharapova. Her appearance in Rome increased her ranking to No. 52, placing her as the third-ranked American. She lost in the second round of the French Open to Agnieszka Radwańska in straight sets. At Wimbledon, Williams was unseeded for the first time since 1997. She lost to Elena Vesnina in the first round in straight sets. This was the first time Williams lost in the first round of a Grand Slam since the 2006 Australian Open, and her first opening round loss at Wimbledon since her debut in 1997. Williams fared better in her return to doubles competition where she played alongside her sister, Serena. In just the pair's first tournament since 2010 Wimbledon, the unseeded sisters advanced to the final with victories over fourth-seeds Maria Kirilenko and Nadia Petrova in the second round and top-seeds Liezel Huber and Lisa Raymond in the semifinals. The Williams sisters claimed their fifth Wimbledon doubles title after defeating sixth-seeds Andrea Hlaváčková and Lucie Hradecká in straight sets in the final, on the same day Serena won her fifth Wimbledon singles title. Williams's next stop was the 2012 Summer Olympic Games which was held at the All England Club, Wimbledon. She entered the women's singles and women's doubles events, partnering with sister Serena in doubles. In singles, Williams defeated Sara Errani and Aleksandra Wozniak in convincing fashion to reach the third round where she faced Angelique Kerber. She lost to Kerber in two tiebreaks despite having three set points and leading 5–1 in the tiebreak in the first set. In doubles, the unseeded Williams sisters advanced to the final, which was a repeat of their final at Wimbledon against Hlaváčková and Hradecká. The sisters won their third gold medal in doubles after defeating the Czech pair in straight sets. With the win (and Serena's win in the singles event), the Williams sisters claimed the most Olympic gold medals than any other tennis player, male or female. Next, Williams played at Cincinnati where she received a singles wild card entry. She defeated her first two opponents, Maria Kirilenko and Chanelle Scheepers, in three tight sets before crushing 8th seed Sara Errani in the third round. In the quarterfinal, she defeated her second top 10 opponent in a row Samantha Stosur in three sets to advance to her first semifinal since the 2010 US Open. In the semifinal Williams played through a back injury, eventually losing in three sets to Li Na in a match where her average first serve was between 80–90 miles per hour. Her semifinal run brought her ranking back within the top 50 for the first time in almost a year. At the US Open Williams lost in a second-round match against Angelique Kerber in three sets, despite having a 4–2 lead in the third set. Williams won her 44th WTA career title and her first title in over two and half years at the 2012 BGL Luxembourg Open, where she defeated Monica Niculescu in straight sets. Williams also qualified for the WTA Tournament of Champions in Sofia, but withdrew as the tournament clashed with her and Serena's 'Breaking the Mould' tour in Africa. With her title in Luxembourg, her ranking rose to number 24. She ended the year with this ranking. At the 2013 Hopman Cup, and playing for USA (with John Isner), the first rubber was against South Africa. Williams beat Chanelle Scheepers and, with John Isner, they comfortably defeated the South African pair Chanelle Scheepers and Kevin Anderson. In USA's second rubber against France, she won both her singles and in mixed doubles defeated Jo-Wilfried Tsonga and Mathilde Johansson. Next she faced Anabel Medina Garrigues of Spain and won in two sets. From there Williams went onto the Australian Open, seeded 25, after missing it the previous year due to injury. She beat Galina Voskoboeva and Alizé Cornet before losing to the second seed, Maria Sharapova. Her next tournament was Brasil Tennis Cup. She participated the tournament as the 1st seed. She defeated Mirjana Lučić-Baroni in the first round, Garbiñe Muguruza in the second round and Magdaléna Rybáriková during the quarterfinals. Reaching her first semifinal of the year, she was then defeated by Olga Puchkova in three sets. This tournament allowed Williams to strengthen her position in the Top 20. She retired from the 2013 Sony Open Tennis in the third round due to a lower back injury. One week after Miami, Williams participated in Charleston as the fifth seed. She reached the semifinals, after playing both her third round and quarterfinals matches on the same day, where she lost to her sister, Serena, in two sets in the sisters' first meeting since the 2009 WTA Tour Championships.A few weeks later she participated in Fed Cup, in a tie between the United States and Sweden. After Sloane Stephens lost the opening match, Williams stepped into her spot, winning a match against Johanna Larsson, after converting on her eighth match point. This was the first time in Williams's career that she clinched the winning match in a Fed Cup tie, leading the United States to a 3–2 victory over Sweden. Williams's next event was the Mutua Madrid Open where she withdrew just before playing her first round match, her next tournament was the Italian Open in Rome where she lost in the first round to Laura Robson. Williams then played at the 2013 French Open where she lost to Urszula Radwanska in the first round. She was also entered in Doubles with her sister Serena but pulled out just before their 1st Round match. Williams pulled out of the 2013 Wimbledon Championships due to a back injury. It was the first time she has missed Wimbledon in her career. At the Roger's Cup, she lost in the first round to 13th seed Kirsten Flipkens in three sets. At the 2013 Western and Southern Open, she defeated qualifier Jana Cepelova in straight sets, before losing in the second round to Elena Vesnina in three sets. Her next tournament was the 2013 US Open. She pulled an upset in the first round by defeating 12th seed Kirsten Flipkens in a rematch of the Roger's Cup first round. She was defeated by Zheng Jie in three sets. She entered the doubles with Serena Williams. They beat Carla Suarez Navarro and Silvia Soler Espinosa in the first round. In the second round, the duo beat the 7th seeded team of Abigail Spears and Raquel Kops-Jones, and defeated the 11th seeded team of Anastasia Pavlyuchenkova and Lucie Safarova in the third round. In the quarterfinals, they defeated the 1st seeded team of Sara Errani and Roberta Vinci in a rematch of the Australian Open quarterfinals. Their run ended in the semifinals against the 5th seeded team and eventual champions Lucie Hradecka and Andrea Hlavackova. Her next tournament was the Toray Pan Pacific Open. She defeated Mona Barthel in the first round, and upset the 1st-seeded and No. 2-ranked Victoria Azarenka in the second round. In the third round, she came back from a set down to beat the 13th seed Simona Halep in three sets to make it to the quarterfinals of the Premier 5 event. In the quarterfinals she defeated Canadian Eugenie Bouchard in three sets but fell in the semifinals to Petra Kvitova in another three set match. Williams subsequently played at the 2013 China Open in Beijing where she played singles and doubles. Williams lost her second round match in Singles losing to Sabine Lisicki and she also lost her first round match in Doubles despite having two match points. Williams's last tournament of the season was the 2013 Kremlin Cup in Moscow but she withdrew due to injury bringing an end to her 2013 season. Williams started her official tennis season as No. 47 at the 2014 ASB Classic in Auckland, where she finished runner-up to Ana Ivanovic. She next participated, unseeded, at the 2014 Australian Open where she lost in the first round to No. 23 Ekaterina Makarova in three sets. Moving on to Doha, Williams lost to No. 6 Petra Kvitová in the second round at the 2014 Qatar Total Open after failing to put away match point in the third set tie-break. Williams then entered the Dubai Tennis Championships where she defeated five top-40 players to win her biggest title since the Mutua Madrid Open in 2010 and, at 33 years and 8 months of age, became the seventh-oldest woman to win a WTA singles title. En route, she avenged her loss to Ana Ivanovic in Auckland 6–2, 6–1 and her sister Serena's loss to Alizé Cornet in the semifinals, then won the title match the 6–3, 6–0, keeping her head-to-head record perfect against Caroline Wozniacki. Williams then competed in Miami at the 2014 Sony Open Tennis and in Charleston at the 2014 Family Circle Cup where she lost to Dominika Cibulková on hard and Eugenie Bouchard on clay, respectively – both in the round of 16 and both in three sets. At the 2014 Internazionali BNL d'Italia, Williams failed to force three sets in a loss for the first time that year, falling 4–6, 2–6 to Carla Suárez Navarro. At the 2014 French Open, Williams was upset by No. 56 Anna Karolína Schmiedlová in three sets. Williams then lost in the third round of the 2014 Wimbledon Championships, 7–5, 6–7, 5–7 to eventual champion Petra Kvitová in a classic and much-praised encounter that saw 34 holds of serve and only two breaks. Williams was the only player to take a set against Kvitová in the tournament. Williams played her first tournament of the 2014 US Open Series at the 2014 Bank of the West Classic, where she is a two-time former champion. In the second round, she scored her first Top-10 victory of the year and improved her head-to-head record against Victoria Azarenka to 4–0. In the quarterfinals, Williams lost to No. 18 Andrea Petkovic in three sets. At the 2014 Rogers Cup, Williams defeated No. 24 Anastasia Pavlyuchenkova in three sets, scoring her first victory at that tournament on her fifth attempt. She defeated No. 7 Angelique Kerber in the third round in a three-set thriller described by one of the commentators as "quite simply one of the matches of the 2014 season so far on the WTA". Williams produced yet another upset in three sets against Carla Suárez Navarro to advance to the semifinals, where she defeated younger sister and No. 1 Serena Williams in the pair's 25th meeting. It was her 14th victory over a reigning No. 1 and her first since the 2009 Wimbledon Championships, when she defeated Dinara Safina 6–1, 6–0 in the semifinals. It was also the first time since 2009 that Williams had beaten Serena. She lost the championship match 4–6, 2–6 to No. 5 Agnieszka Radwańska. At her final tournament before the 2014 US Open, Williams lost in a tight three-setter to No. 17 Lucie Šafářová in the first round at the 2014 Western & Southern Open. At the US Open Williams made it to the third round for the first time since 2010 and was two points away (multiple times) from moving into the Round of 16 before ultimately going down to 13th-seeded Sara Errani for the first time in four meetings. Williams's next tournament was at the 2014 Coupe Banque Nationale in Quebec, where she received a wildcard as the No. 1 seed. She advanced to the quarterfinals in straight-set first- and second-round victories and was set to play Czech player, Lucie Hradecká. She defeated Hradecká in a 2-hour, 13-minute match, winning 6–3, 4–6, 7–6(3). In the semifinal, Williams beat fellow countrywomen Shelby Rogers in straight sets to progress to her fourth final of the year, where she lost to a resurgent Mirjana Lučić-Baroni in straight sets. Williams then played at the 2014 Wuhan Open, where she lost in the first round to Caroline Garcia despite having held a match point. Her final tournament of the year was at the 2014 China Open, where she won her first two matches before withdrawing before the third round. Williams ended the year ranked No. 19 in singles, the first finish since 2010 inside the top 20. Williams joined the Bangalore Raptors team in 2014 for the first edition of Champions Tennis League India. Williams started off her season at the 2015 ASB Classic, where she won her 46th career singles title by defeating Caroline Wozniacki in three sets in the final. Then, at the Australian Open, Williams made it to the quarterfinals at a Grand Slam for the first time since the 2010 US Open. She defeated Camila Giorgi in the third round having to recover from 4–6, 2–4 and 0–40 down to reach the second week of a Grand Slam tournament for the first time since the 2011 Wimbledon Championships and then overturned a three-match losing streak to Agnieszka Radwańska before losing to Madison Keys after being up a break in the deciding set. Williams had her 16-match winning streak at the Dubai Tennis Championships ended by Lucie Šafářová in the third round. Her next tournament was at the Qatar Total Open where she saved a match point in a heated encounter versus Barbora Záhlavová-Strýcová in the second round before defeating Agnieszka Radwańska for a second time in 2015 to advance to the semifinals. She ended up losing in three sets to Victoria Azarenka. Williams competed at the Miami Open, where she won against Samantha Stosur in the third round and Caroline Wozniacki in the fourth round (scoring her fourth top-10 win of the season and improving her head-to-head record against Wozniacki to a perfect 7–0). In the quarterfinals, she was defeated by Carla Suárez Navarro in three sets. Williams began her clay court season at the Madrid Open where she lost in the first round to Victoria Azarenka in straight sets. She made it to the third round of the Italian Open before losing to Simona Halep. Williams failed to win her opening match at the 2015 French Open, where she lost in straight sets to American Sloane Stephens. She did not attend her mandatory post-match press conference and was subsequently fined $3000. Williams then played at Wimbledon, winning her first three rounds in straight sets. She then lost to her sister, Serena, in the fourth round in straight sets (4–6 3–6). Williams then played at the Istanbul Cup where she lost in the first round to qualifier Kateryna Bondarenko. Williams began her US Open series at the Rogers Cup, where she was a finalist last year. She lost in the first round, 6–0, 6–3 to Sabine Lisicki. Her loss pushed her outside of the top 20. Her next tournament was at the Western and Southern Open in Cincinnati. She made it to the second round and was set to play Ana Ivanovic, before she withdrew due to a virus. She was seeded 23rd for the US Open and played Monica Puig in the first round. She led 6–4, 5–3 and held three match points, but lost the second set. She won the match 6–4, 6–7(7–9), 6–3. In the second round, she overcame 2 costly double faults in the second set to defeat fellow American Irina Falconi 6–3, 6–7(2–7), 6–2. She defeated 12th seed Belinda Bencic and qualifier Anett Kontaveit in straight sets in the third and fourth rounds, respectively. Williams played her sister, Serena, in the quarterfinals in their 5th meeting at the US Open and their 27th meeting overall. Williams lost the match in three sets (2–6, 6–1, 3–6). Williams scored her fifth top 10 win of the season by defeating No. 7 Agnieszka Radwańska in the first round of the Wuhan Open. She then beat qualifier Julia Görges in the second round for her 700th career win (becoming only the ninth woman in the Open Era to achieve this feat). She landed another top 10 victory by winning against No. 10 Carla Suárez Navarro in the third round. Williams defeated both Johanna Konta and Roberta Vinci (saving match point) in three sets to move into the championship match where she won her biggest title in more than 5 years when her opponent, No. 8 Garbiñe Muguruza, retired while trailing a set and a double break. The next week Williams lost to Ana Ivanovic in the second round of the China Open. She made it to the semifinals of the Hong Kong Open where she lost in a tight two-setter to eventual champion Jelena Janković. With her results throughout the season, Williams became an Alternate for the WTA Finals in Singapore. Additionally, she qualified for the WTA Elite Trophy in Zhuhai where she is the number one seed. She defeated Madison Keys in her first round-robin match in three sets, 3–6, 7–6(7–5), 6–1. In her second round-robin match she defeated wildcard Zheng Saisai 4–6, 6–1, 6–1 to advance to the semifinals, where she defeated Roberta Vinci for a fifth consecutive time. Williams captured the first WTA Elite Trophy, her third WTA title of the season and 48th title of her career by defeating Karolína Plíšková, 7–5, 7–6(8–6) in the final. She re-entered the top ten for the first time since 2011 and ended the year at No. 7 in the WTA rankings. Williams was the 10th most popular player of the year according to the WTA's website and received the WTA Comeback Player of the Year award. Williams began 2016 by playing at the World Tennis Thailand Championship – an exhibition event in Thailand – where she lost to Sara Errani and Angelique Kerber. She then entered the ASB Classic, where she was the No. 1 seed and defending champion, and lost in the first round to 18-year-old Daria Kasatkina. (This was also Williams's first tournament since the 2011 Australian Open as a top-10 player.) At the Australian Open, Williams, seeded 8th, lost to Johanna Konta in the first round. Afterwards, she helped the USA Fed Cup Team to a 4–0 victory over Poland, winning both of her singles matches. Williams's next tournament was at the Taiwan Open, where she was the No. 1 seed. She defeated Misaki Doi in the final, earning her 49th career title. Williams returned to Indian Wells for the first time in 15 years after boycotting the tournament in 2001, but lost in the second round to Kurumi Nara. The following week, she was knocked out in the second round of the Miami Open by qualifier Elena Vesnina. Both results marked her worst exits at Indian Wells and Miami in her 23-year career. She began the clay-court season with a win over Alison Riske at the Charleston Open, before losing to Yulia Putintseva in the third round in three tight sets. Williams was scheduled to begin her clay-court season at the Madrid Open but withdrew due to a hamstring injury. The following week, she lost in the second round in Rome. Seeded 9th at the French Open, Williams won her first two rounds in straight sets to set up a third-round clash with Alize Cornet, whom she defeated in three sets to reach the fourth round for the first time since 2010. She recorded the 200th loss of her career against 8th-seeded Timea Bacsinszky, who won in straight sets. However, her result pushed her back into the top 10 for the first time since her loss at the Australian Open. She also won her first Grand Slam doubles match with sister Serena since the 2014 US Open. At the Wimbledon Championships, Williams reached the third round of the championships where she overcame the 29th seed, Daria Kasatkina, in a 2-hour, 42-minute marathon. She defeated 12th seed Carla Suarez Navarro in the fourth round, and now leads 4–3 in their head-to-head meetings. Williams advanced to the quarterfinals for the first time in six years, where she defeated Yaroslava Shvedova. In her first Grand Slam semifinal since the 2010 US Open and her first Wimbledon semifinal since 2009, she lost to 4th seed Angelique Kerber in straight sets. In the doubles tournament, Venus and Serena advanced to their first Grand Slam Doubles final since 2012. They then won their 14th major title together and sixth at Wimbledon. Williams began her US Open series at the Stanford Classic, where she was the No. 1 seed. She defeated Magda Linette in the second round and compatriots Catherine Bellis and Alison Riske in the quarterfinals and semifinals respectively to reach her eighth final in Stanford. She lost to Johanna Konta, 5–7, 7–5, 2–6. By virtue of her result, Williams ascended to No. 6 in the rankings, her highest position since being diagnosed with Sjögren's syndrome in 2011. Williams then entered the Rogers Cup. Having received a bye in the first round, Williams won her second-round match against Barbora Strycova in straight sets. She fell to Madison Keys in the third round in three sets. Williams failed to medal in her singles and doubles events at the 2016 Olympic Games in Rio, falling in the first round in both events, marking her worst exits of her Olympic career. She entered the mixed doubles event with Rajeev Ram, defeating the Netherlands in the first round after saving match point. The pair then defeated Italy in the quarterfinals and India in the semifinals to set up a clash with the United States team of Bethanie Mattek-Sands and Jack Sock in the gold medal match. The duo lost to Mattek-Sands and Sock 7–6(7–3), 1–6, [7–10]. By winning a silver medal, Williams became the only female player (besides Kathleen McKane Godfree) to win a medal in all three events (singles, doubles and mixed); her five medals mean she now shares the record for most Olympic medals won in tennis with Godfree. At the US Open, Williams broke the record for the most Grand Slam appearances, surpassing Amy Frazier's record of 71. This is also the first time that she's been seeded in the top ten at all four Grand Slam tournaments this year, having last achieved this in 2010. She won her first three round matches respectively against Kateryna Kozlova, Julia Görges and the 26th seed Laura Siegemund. She lost in the fourth round to 10th seed Karolína Plíšková after failing to convert match point. In September 2016, in response to WADA database leak, Williams confirmed the usage of banned substances classified by WADA as Therapeutic Use Exemptions (TUEs), stating: "The applications for TUEs under the Tennis Anti-Doping program require a strict process for approval which I have adhered to when serious medical conditions have occurred". Williams failed to defend her title in Wuhan, falling in the third round to 9th seed Svetlana Kuznetsova. This pushed her outside of the top ten for a second time this year. The following week she was bundled out of the China Open in the first round by No. 223-ranked Peng Shuai. Williams qualified for the WTA Elite Trophy, where she was the defending champion, however she decided not to participate. She finished the year ranked No. 17. Williams began her 2017 season at the ASB Classic, winning her opening match against local wildcard Jade Lewis before withdrawing due to a right arm pain. Seeded 13th at the Australian Open, Williams defeated Kateryna Kozlova, qualifier Stefanie Vögele, Duan Yingying and qualifier Mona Barthel in the opening four rounds respectively in straight sets to advance to the quarterfinals. She defeated 24th seed Anastasia Pavlyuchenkova for her 50th win at the Australian Open, the first time Williams won a quarterfinal match in Melbourne since defeating Daniela Hantuchová in 2003. Coming back from a set down in her semifinal match, Williams defeated rising American star Coco Vandeweghe 6–7(3–7), 6–2, 6–3 to advance to her first Grand Slam final since Wimbledon 2009 and her first Australian Open final since 2003. In doing so, she set the Open Era record for the longest span (20 years) between grand slam singles final appearances, having first reached a grand slam singles final at the 1997 US Open. In a closely fought final, she lost 6–4, 6–4 to her younger sister Serena Williams, who made history by winning her 23rd Grand Slam singles title, surpassing the mark set by Steffi Graf. The following week, Williams competed in the St. Petersburg Ladies' Trophy, but lost in the second round to eventual champion Kristina Mladenovic. At the Indian Wells Masters, Williams came back from 1–6, 1–4 down and saved three match points in the second round to defeat Jelena Jankovic, tying their head-to-head record at seven-all. This was her first win at Indian Wells since 2001. She defeated Lucie Safarova and qualifier Peng Shuai in the third and fourth rounds respectively, avenging her previous losses to both players. She lost to the eventual champion, Elena Vesnina, in the quarterfinals. The following week, Williams scored her first top-ten win since 2015, against Svetlana Kuznetsova in the fourth round of the Miami Open. She defeated No. 1 Angelique Kerber in the quarterfinals, becoming the oldest player to beat a current No. 1. She lost for a third consecutive time to eventual champion Johanna Konta in straight sets in her first semifinal in Miami since 2010. This marked her fourth consecutive loss to eventual champions. The following week, after receiving a bye, Williams lost to eventual semi-finalist Laura Siegemund in the Volvo Car Open. Having saved match point in the second set, Williams forced two match points in the third set, but Siegemund saved both. After the match, Williams said, "This could be the best match she'll ever play in her life. I basically won the match but still lost." Williams withdrew from the Madrid Open after an injury to her right arm. She made her European clay-court debut at the Italian Open where she defeated Yaroslava Shvedova and Lesia Tsurenko in straight sets. She defeated No. 6 Johanna Konta in the third round, but lost in her first quarterfinal in Rome since 2012 to Garbiñe Muguruza in three sets. During this match, Williams hit a reactionary lob off an attacking forehand that was voted WTA shot of the month. Williams defeated Qiang Wang, Kurumi Nara and Elise Mertens in the first three rounds of the French Open before again losing to Bacsinszky in the fourth round, this time in three sets. Williams entered Wimbledon as the number 10 seed. She defeated Elise Mertens, Qiang Wang, Naomi Osaka and Ana Konjuh to reach the quarterfinals for the 13th time in her career, where she defeated the 2017 French Open Champion Jelena Ostapenko in straight sets. This was also her 100th career match at Wimbledon. She advanced to her ninth Wimbledon final by defeating Johanna Konta in straight sets in the semifinals. This marked her 87th win at Wimbledon, the third most on the all-time list. This also marked the first season since 2003 that Williams reached two slam finals. Williams lost the final in straight sets to Garbiñe Muguruza. She gained the No. 9 ranking by reaching the final, her second appearance in the top 10 in 2017; she had briefly returned to the top 10 in 2017 by virtue of beating Angelique Kerber in Miami. Williams began her play in the US Open Series at the Canadian Open. She defeated qualifier Irina-Camelia Begu in three sets and Kateřina Siniaková in straight sets before losing to fifth seed and eventual champion Elina Svitolina in the third round. The next week Williams competed in the Cincinnati Masters tournament. She defeated Alison Riske in the first round before losing to Ashleigh Barty in the second round. Barty was the first person to have defeated Williams and fail to reach at least the semifinals of the event in which they had defeated her in 2017. At the 2017 US Open, Williams defeated Viktória Kužmová, Océane Dodin, and Maria Sakkari to reach the fourth round. Williams reached the second week of all grand slams in a single season for the first time since 2010, and reached the second week of seven consecutive grand slams, the longest streak among WTA players at that time. In the fourth round, Williams beat Carla Suárez Navarro in three sets to reach her twelfth US Open quarterfinal, where she defeated Petra Kvitová in a third set tiebreak during the two-hour, thirty-five minute match. She also guaranteed her return to the top five in the WTA Rankings at the conclusion of the tournament for the first time since January 2011. Williams then lost in three sets to fellow American and eventual champion Sloane Stephens in her first US Open semifinal since 2010. On September 26, Williams qualified for the WTA Finals for the first time since 2010. In her first tournament after the U.S. Open, Williams defeated Risa Ozaki in the first round of the Hong Kong Open, before falling to Naomi Osaka. At the WTA Finals, Williams was placed in the White Group with Karolina Pliskova, Garbiñe Muguruza and Jelena Ostapenko. After losing her first match to Pliskova in straight sets, Williams defeated Ostapenko in a marathon match lasting almost three and a half hours. She defeated Muguruza in straight sets to progress to the semifinals, avenging her loss to the Spaniard in the Wimbledon final. Williams then defeated Caroline Garcia in three sets to advance to her first final at the year-end championships since 2009, where she finished runner-up to sister Serena. She met Caroline Wozniacki in the final, where she found herself down a set and 0–5. Despite winning the next four games, she lost the match, 4–6 4–6. She finished the year ranked number 5 and topped the prize money list for this year. Williams began her 2018 season at the Sydney International, where she was the second seed and received a first-round bye. In the second round she lost to Angelique Kerber, who went on to win the tournament. As the fifth seed and defending finalist at the Australian Open, Williams lost in straight sets to Belinda Bencic in the first round, ending her streak of seven consecutive appearances in the second week of the Grand Slams. Williams competed in the Fed Cup quarter-finals against the Netherlands. She won both her singles matches in straight sets against Arantxa Rus and Richèl Hogenkamp to send the United States into the semifinals. She also played her career 1000th match and earned her 20th Fed Cup singles win. After receiving a first round bye at the Indian Wells Masters, Williams defeated Sorana Cirstea to set up a match with sister Serena in the third round. She defeated Serena for the 12th time in her career – her first straight sets victory against her since the 2008 Wimbledon Championships final. She then defeated Anastasija Sevastova in the fourth round and Carla Suarez Navarro in the quarterfinals, both in straight sets. She fell to Daria Kasatkina in a close three set match in the semifinals. The following week at the Miami Open, Williams saved three match points in her third round match against Kiki Bertens. She knocked out defending champion Johanna Konta in the fourth round before falling to American qualifier Danielle Collins in the quarterfinals. Williams began her clay court season at the Madrid Open where she lost to Anett Kontaveit in the first round. Seeded eighth at the Italian Open, she received a first round bye before defeating Elena Vesnina in three sets. She lost to Kontaveit again in the third round. Williams also played doubles with compatriot Madison Keys, but the team withdrew after winning their first round match with Keys sustaining an injury. Williams lost to Qiang Wang in the first round of the French Open, marking the first time she has lost in the first round of consecutive Grand Slam events. Williams also reached the third round in doubles with her sister Serena, losing to third seeds Klepac and Martinez Sanchez. The defending finalist at the Wimbledon, Williams defeated Johanna Larsson and Alexandra Dulgheru in the first and second rounds respectively before losing to Kiki Bertens in the third round. As a result, she dropped out of the top ten rankings. Williams began her US Open series at the Silicon Valley Classic after accepting a wildcard, defeating Heather Watson in the second round before losing in the quarterfinals to eventual finalist Maria Sakkari. She won her opening two rounds at the Rogers Cup before losing 6–2, 6–2 to the world number one, Simona Halep, hampered by a right knee injury. She withdrew from the Western & Southern Open the following week with the same injury. At the US Open, Williams defeated 2004 champion Svetlana Kuznetsova and Camila Giorgi en route to a third round encounter – and 30th career match overall, with Serena, where she was handed her most-lopsided loss against her in five years. Following the US Open, Venus withdrew from the Wuhan Open and China Open, citing she is not physically ready to compete. She was scheduled to finish her season at the Luxembourg Open, but pulled out due to a knee injury. She finished the season ranked no. 40, the first time since 2013 she failed to finish the season inside the top 20. Williams parted ways with her long-time coach David Witt at the end of the 2018 season. Williams began her 2019 season with an exhibition match against Serena at the Mubadala World Tennis Championship, which she won 10-8 in the match tiebreak. Williams then played in the Auckland Open where she was seeded sixth. She defeated Victoria Azarenka and Lauren Davis before losing in the quarterfinals to Bianca Andreescu in three sets. Unseeded at the Australian Open, Williams defeated Mihaela Buzarnescu and Alize Cornet, both in three sets, to set up a meeting with top seed Simona Halep in the third round. Williams lost to Halep 2-6, 3-6. Unseeded at Indian Wells, Williams started with a win over Andrea Petkovic before coming back from a set and a double break down to beat the three seed Petra Kvitova in the second round. This was Williams first top five win since the 2017 WTA Finals. Williams defeated Christina McHale and Mona Barthel to advance to her third straight Indian Wells quarterfinal where she lost to the eight seed and eventual runner-up Angelique Kerber. At the Miami Open, Williams beat Dalila Jakupović, Carla Suarez Navarro, and Daria Kasatkina, all in straight sets, to reach the fourth round where she will play the number two seed Simona Halep. She later lost in straight sets. After that, her ranking dropped to No. 48. Williams has played younger sister Serena in 30 professional matches since 1998. Overall, Venus has won 12 of those matches and Serena has won 18. They have met in 15 Grand Slam tournaments, with Venus winning five matches to Serena's ten. They have met in nine Grand Slam tournament finals, with Venus winning twice. Of the six occasions where they met in an earlier round, the victor has gone on to win the championship four times (Venus once, in the 2000 Wimbledon Championships). Beginning with the 2002 French Open, they played each other in four consecutive Grand Slam singles finals, which was the first time in the open era that the same two players had contested four consecutive major finals. Williams and Hingis met 21 times during their careers. The overall head-to-head series is 11–10, in Hingis' favor. Their rivalry is one of the best in women's sports and has been called a "rivalry for the ages". The pair met in the 1997 US Open final during Williams's debut, Hingis won the match in straight sets. Davenport leads the rivalry 14–13 in their 27 professional matches. Williams leads 3–0 in Grand Slam Finals. The most noteworthy match they played was the 2005 Wimbledon championships which broke the record for the longest Wimbledon women's final. Williams won the match and also saved a match point, which makes her only the second woman in the Open Era to save a match point and go on to win during a grand slam final. Despite years of protesting by tennis pioneer Billie Jean King and others, in 2005 the French Open and Wimbledon still refused to pay women's and men's players equally through all rounds. In 2005, Williams met with officials from both tournaments, arguing that female tennis players should be paid as much as male tennis players. Although WTA tour President Larry Scott commented that she left "a very meaningful impression", Williams's demands were rejected. Wimbledon has justified treating women as second class because we do more for the tournament. The argument goes that the top women – who are more likely also to play doubles matches than their male peers – earn more than the top men if you count singles, doubles and mixed doubles prize money. So the more we support the tournament, the more unequally we should be treated! But doubles and mixed doubles are separate events from the singles competition. Is Wimbledon suggesting that, if the top women withdrew from the doubles events, that then we would deserve equal prize money in singles? And how then does the All England Club explain why the pot of women's doubles prize money is nearly £130,000 smaller than the men's doubles prize money? In response, British Prime Minister Tony Blair and members of Parliament publicly endorsed Williams's arguments. Later that year, the Women's Tennis Association and UNESCO teamed for a campaign to promote gender equality in sports, asking Williams to lead the campaign. Under enormous pressure, Wimbledon announced in February 2007 that it would award equal prize money to all competitors in all rounds, and the French Open followed suit a day later. In the aftermath, the Chicago Sun-Times cited Williams as "the single factor" that "changed the minds of the boys" and a leader whose "willingness to take a public stand separates her not only from most of her female peers, but also from our most celebrated male athletes." Williams herself commented, "Somewhere in the world a little girl is dreaming of holding a giant trophy in her hands and being viewed as an equal to boys who have similar dreams." Williams herself became the first woman to benefit from the equalization of prize money at Wimbledon, as she won the 2007 tournament and was awarded the same amount as the male winner Roger Federer. Williams's fight for equality was documented in Nine for IX, Venus Vs. It premiered on July 2, 2013. Williams competed in a "Battle of the Sexes", along with her sister Serena Williams, against Karsten Braasch at the 1998 Australian Open, who at the time was ranked 203rd. A decade and a half younger than Braasch, who was described by one journalist as "a man whose training regime centered around a pack of cigarettes and more than a couple bottles of ice cold lager." He nonetheless defeated both sisters, playing a single set against each, beating Serena 6–1 and Venus 6–2. Braasch said afterwards, "500 and above, no chance." He added that he had played like someone ranked 600th in order to keep the game "fun." Williams for the National Heart, Lung, and Blood Institute's "National Wear Red Day"
In 2003, at age 31, Yetunde Price, Venus and Serena Williams' older half-sister, was shot dead in Compton, California, near the courts on which the sisters once practiced. 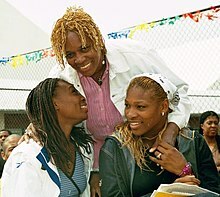 Price was the Williams sisters' personal assistant. The Williams family issued this statement shortly after the death: "We are extremely shocked, saddened and devastated by the shooting death of our beloved Yetunde. She was our nucleus and our rock. She was a personal assistant, confidante, and adviser to her sisters, and her death leaves a void that can never be filled. Our grief is overwhelming, and this is the saddest day of our lives." On December 13, 2007, Williams received her associate degree in fashion design from the Art Institute of Fort Lauderdale. Williams' longtime boyfriend, pro golfer Hank Kuehne, was a visible presence from the time of Wimbledon 2007 until 2010, when Kuehne dated and (in May 2011) married his current wife, Andy. Williams is now dating millionaire heir Nicholas Hammond. In 2011, Williams was forced to withdraw from the US Open before her second-round match, following a Sjögren's syndrome diagnosis. After the diagnosis, she adopted a vegan diet, as well as reducing her intake of calories and sugars, which helped get her back to match winning fitness. In 2015, Williams received a Bachelor of Science degree in Business Administration from Indiana University East. Starting in 2011, she completed the degree through a reciprocal agreement between the university and the Women's Tennis Association which allows athletes to play tennis professionally while studying online. Her ultimate goal is to get an MBA in the near future. Williams considers herself to be one of Jehovah's Witnesses. On June 9, 2017, Williams was driving in Palm Beach Gardens, Florida, when another car collided with her SUV before she cleared the intersection, an accident that killed a 78-year-old man and injured another person in the second vehicle. Police originally said she was "at fault" for the accident, but after reviewing surveillance video, they determined on July 7 that she had not caused it. On December 21, 2017, authorities determined that the accident occurred after Williams’ vehicle was unlawfully cut off by an unidentified driver of a third vehicle, making a left turn in front of Williams. A nearby surveillance camera had recorded Williams lawfully entering the intersection. Authorities determined the accident was caused by the unidentified third driver, not Williams. Williams is the chief executive officer of her interior design firm V Starr Interiors located in Jupiter, Florida. Her company designed the set of the Tavis Smiley Show on the Public Broadcasting Service, the Olympic athletes' apartments as part of New York City's failed bid to host the 2012 Olympic Games, and residences and businesses in the Palm Beach, Florida area. In 2007, Williams teamed with retailer Steve & Barry's to launch her own fashion line, EleVen. "I love fashion and the idea that I am using my design education to actually create clothing and footwear that I will wear on and off the tennis court is a dream come true for me. The vision has been to create a collection that will allow women to enjoy an active lifestyle while remaining fashionable at the same time. I'm thrilled with everything we've created to launch EleVen." Williams' line, EleVen made its debut at the 2012 New York fashion week. It was modeled by athletes as opposed to models, a choice made by Williams herself to feature the sort of people the line was designed for. She flaunts her vibrant outfits each time she steps on the court. In June 2009, Williams was named 77th in the Top 100 Most Powerful Celebrities compiled by Forbes magazine. In August 2009, Williams and her sister Serena became part-owners of the Miami Dolphins. The announcement was made during a press conference overlooking the practice field. This made the sisters the first African-American women to obtain ownership in an NFL franchise. Stephen M. Ross, the majority owner of the Dolphins, said "We are thrilled to have Venus and Serena join the Dolphins as limited partners. They are among the most admired athletes in the world and have become global ambassadors for the game of tennis. Their addition to our ownership group further reflects our commitment to connect with aggressively and embrace the great diversity that makes South Florida a multicultural gem." In late June 2010, Williams released her first book, Come to Win; on How Sports Can Help You Top Your Profession, which she co-wrote with Kelly E. Carter. In promotion of the book she embarked on a tour around America in support of the release, whilst also appearing on several talk shows, including The Early Show and Good Morning America. This gave her a place in the Top 5 of The New York Times Best Seller List. In 2005 Tennis Magazine ranked her as the 25th-best player in 40 years. In June 2011, she was named one of the "30 Legends of Women's Tennis: Past, Present and Future" by Time. In March 2012, Tennis Channel aired a television series "100 greatest tennis players of all time", where she was ranked as 22nd. During the programme Williams was complimented by rival Lindsay Davenport, with Davenport saying 'Venus had more power than any other player on tour'. In 1995, when Williams was 14 years old, she signed an endorsement deal with Reebok and wore the company's apparel and shoes. She used Wilson Hammer 6.2 Stretch racket. In 1997, Williams became the first woman since Pam Shriver in 1978 to reach the singles final of the US Open on her first attempt. In 1997, the combined ages of Williams at age 17 and Martina Hingis at age 16 in the US Open final were the lowest in the open era history of that tournament. At 1999 IGA SuperThrift Classic in Oklahoma City marking the first time in tennis history that sisters won titles in the same week (Serena won the Open Gaz de France in Paris). 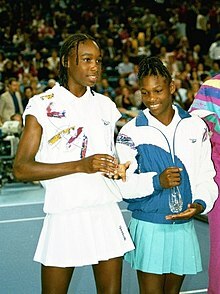 At the 1999 Lipton International Players Championships in Key Biscayne became the first pair of sisters in the open era to meet in a tournament final (with Serena Williams). In 2000, Williams became the second African-American to win Wimbledon during the open era. At the 2000 Sydney Olympics, Williams became only the second player to win Olympic gold medals in both singles and doubles at the same Olympic Games, after Helen Wills Moody in 1924. Serena Williams has since joined these 2 women in completing this feat when she won gold in the Singles at 2012 London Olympics. By winning the 2001 Australian Open doubles championship, Venus and Serena Williams became the fifth pair to complete a Career Doubles Grand Slam and the only pair to win a Career Doubles Golden Slam. The 2001 US Open marked the first time in the open era, and only the second time in 117 years, that sisters met in a Grand Slam singles final (with Serena Williams). In 2001, she became the third woman in the open era, after Navratilova and Graf, to win both Wimbledon and the US Open in consecutive years. In February 2002, she became the first African-American woman to become world No. 1 since the computer rankings began in 1975. In March 2002, at the Miami Open, her record streak of 22 consecutive wins (won the 1998, 1999, and 2001 titles [skipped 2000]) came to an end at the hands of her sister, Serena, who would go on to win the 2002 title. Serena would also win the 2003 and 2004 titles by winning 18 consecutive matches. In the 2005 Miami Open, Venus would play Serena in the quarterfinals after Serena won her 21st consecutive match in the third round. Venus would end up defeating her younger sister in straight sets, including a riveting 7–6 (10–8) second set, to halt her streak one win short of tying Venus' record. On June 10, 2002, Venus and Serena became the first sisters to hold the No. 1 and No. 2 spots in the singles rankings, respectively. Serena would supplant Venus for the No. 1 ranking on July 8, 2002 and they would remain at No. 1 and No. 2 in the rankings until Venus fell to No. 3 on April 14, 2003. On June 21, 2010, Venus and Serena again occupied the No. 2 and No. 1 spots in the singles rankings, respectively. This came almost exactly 8 years after first accomplishing this feat. At the time, Venus had just celebrated her 30th birthday and Serena was three months shy of her 29th birthday. Both were already beyond the ages at which many of their peers had retired. At Wimbledon in 2003, she reached her fourth consecutive Wimbledon final, which since the abolishment of the challenge round system is tied with Helen Wills Moody for fourth behind Navratilova's nine, King's five, and Evert's five. Williams, Hingis and Goolagong hold the Open Era record for consecutive losses in Grand Slam singles final appearances (five). One of four women, the others being Serena Williams, Navratilova and Graf, to win the Wimbledon singles title at least five times during the Open Era. During the 2008 WTA Tour Championships became the 3rd player after Steffi Graf and Serena Williams to beat the second Dinara Safina, third Serena Williams and first Jelena Jankovic ranked players in the same tournament. At Wimbledon in 2009, Williams defeated No. 1 Dinara Safina in the semifinals 6–1, 6–0, which was the most one-sided women's semifinal at Wimbledon since 1969, when King defeated Rosemary Casals by the same score. At the Miami Open, Venus and Serena have won a combined 11 titles, including 4 consecutive years from 2001 to 2004. Additionally, they both played in the championship match in 1999 and 2001. Venus would defeat Serena in the 1999 final and Serena would turn the tables two years later and beat Venus for the 2001 title. 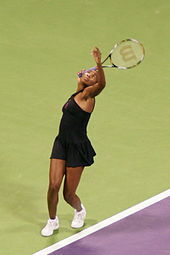 Williams held the record for the fastest serve in women's tennis at 207.9 km/h (129.2 mph), achieved at the 2007 US Open. She held this record for almost 7 years, until her record was broken by Sabine Lisicki at the 2014 Stanford Classic with a service speed of 210.8 km/h (131.0 mph). Williams became the first women to win both Year-end Championships (the WTA Finals and the WTA Elite Trophy). She won the 2008 WTA Finals and then the inaugural WTA Elite Trophy in 2015. By reaching the semifinals of the 2016 Wimbledon Championships, Williams became the oldest woman (at 36 years) to progress to a Grand Slam semifinal since Martina Navratilova in 1994 at Wimbledon. Williams also became just the third player over 36 years to reach a Grand Slam semifinal after Navratilova and Billie-Jean King. She achieved this feat again when she reached the semifinals at the 2017 Australian Open and the 2017 Wimbledon Championships at 37 years of age. At the 2017 Australian Open, Williams, at the age of 36 years, 7 months and 14 days became the oldest Australian Open singles finalist in the Open Era. At the 2017 Miami Open, Williams became the third woman to record 60+ wins behind her sister Serena and Steffi Graf. She also became the oldest woman at 36 years and 10 months to defeat a current world number one, defeating Angelique Kerber at this event in the quarterfinals. At the 2017 Wimbledon Championships, Williams joined Martina Navratilova as a fellow 37-year old singles finalist. During the 2017 US Open, Williams tied Chris Evert's record of most first round wins at the US open without a loss, they share the record at 19. Williams also achieved her 74th US open match win, putting her third on the all time list. Behind Chris Evert and her sister Serena. Williams qualified for the 2017 WTA finals, making her the third oldest athlete to qualify in the competition's history. The only two women older than Williams were Billie Jean King and Martina Navratilova. During the 2017 WTA finals Williams competed against Ostapenko, their match had 37 games. That is the most games in a three set format in the tournament's history. The match lasted 193 minutes, the second longest match since the tournament was held in Singapore. Williams prevailed in the marathon match 7–5, 6–7, 7–5. Williams became the oldest finalist in the WTA Finals at 37 years old. She was beaten in straight sets by Caroline Wozniacki. ^ "Venus Williams Biography". Biography. Retrieved August 28, 2018. ^ a b "Venus Williams Career Statistics". Women's Tennis Association. Retrieved September 4, 2016. ^ "Career Prize Money Leaders" (PDF). Women's Tennis Association. August 29, 2016. Archived from the original (PDF) on June 12, 2016. Retrieved September 4, 2016. ^ "Family Tree Legends". Family Tree Legends. Retrieved October 6, 2010. ^ "WTA Rankings". wtatennis.com. WTA. Retrieved March 14, 2019. ^ Michael Kimmelman (August 25, 2010). "How Power Has Transformed Women's Tennis". The New York Times. ^ Allen, JA. "The Williams Sisters and the Rise of the Women's Power Game". ^ Karen Crouse (August 30, 2009). "Williams Sisters Write Their Own Story". The New York Times. ^ "Tennis records". Tennis X. Retrieved September 12, 2015. ^ "10 Stats to get you primed for the 2017 Australian Open". Tennis Now. January 15, 2017. Retrieved January 18, 2017. ^ "Williams sisters net gold in doubles, beating off Spaniards in final". ESPN. August 17, 2008. Retrieved April 22, 2009. ^ Chase, Chris (September 13, 2010). "Ranking the top-10 women's tennis players of all time – Busted Racquet – Tennis – Yahoo! Sports". Sports.yahoo.com. Retrieved October 6, 2010. ^ Edmondson, Jacqueline (January 1, 2005). Venus and Serena Williams: A Biography. Greenwood Publishing Group. ISBN 9780313331657. ^ Kaufman, Michelle (April 22, 2007). "Venus, Serena reflect as they prepare for Fed Cup". blackathlete.net. Retrieved April 22, 2009. ^ Lydia Pyle, 2005, Venus and Serena Williams, p. 10. ^ the, United States. "Venus Williams: Biography from". Answers.com. Retrieved October 6, 2010. ^ "Venus Williams Interview Australian Open – Jan 17". Tennis-x.com. January 17, 2008. Retrieved October 6, 2010. ^ Harris, Laurie Lanzen; Abbey, Cherie (1999). Biography Today: Profiles of People of Interest to Young Readers. Detroit, MI: Biography Today. pp. 130–142. ISSN 1058-2347. ^ "Venus Envy". Sportsillustrated.com. Archived from the original on July 14, 2012. Retrieved October 6, 2010. ^ "WTA, Info, Venus Williams". WTA Tour, Inc. Archived from the original on September 26, 2011. Retrieved October 4, 2011. ^ "What Happened at Indian Wells?". ESPN. March 11, 2009. Retrieved October 6, 2010. ^ Rogers, Martin (September 13, 2010). "Indian Wells boycott hurts Williamses more than it helps". Sports.yahoo.com. Retrieved October 6, 2010. ^ Keating, Gina; Tippit, Sarah. Eldest sister of Venus, Serena shot dead Archived March 3, 2016, at the Wayback Machine, Rediff, September 15, 2003. Retrieved July 6, 2008. ^ Burt, Jason. Seeds are shaken by Sprem's flowering talent Archived July 25, 2010, at the Wayback Machine, The Independent, June 27, 2004. Retrieved July 6, 2008. ^ "Williams joins women's elite with fourth Wimbledon title". Sport.monstersandcritics.com. July 7, 2007. Archived from the original on March 13, 2008. Retrieved October 6, 2010. ^ "Sister Sister: Venus sets record with 129 mph (208 km/h) serve; Serena sails". SI.com. August 27, 2007. Archived from the original on February 3, 2013. Retrieved April 19, 2008. ^ "Venus Williams Out of Tennis Indefinitely with Mystery Illness". Tennis-x.com. April 9, 2008. Retrieved October 6, 2010. ^ "Venus crashes out of French Open". BBC Sport. May 29, 2009. Retrieved May 30, 2009. ^ "Venus Williams out for the remainder of 2010; Will miss Fed Cup Final, Pro Tennis – News". USTA. October 6, 2010. Retrieved May 7, 2011. ^ "Venus Williams Injury: Tennis Star Withdraws From Australian Open". Huffington Post. January 21, 2011. Retrieved May 17, 2011. ^ "Venus Retires, Petkovic Moves Through". Wtatennis.com. January 21, 2011. Retrieved May 17, 2011. 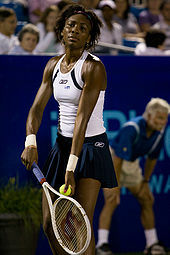 ^ "Venus Williams Out Again For The Western & Southern Open". tennisnow.com. 2011. Retrieved September 1, 2011. ^ Lynch, Lauren. "Venus Williams Out Again For The Western & Southern Open". Tennis Now. Retrieved August 16, 2011. ^ "Venus Williams Pulls Out with illness". ESPN Online. Associated Press. 2011. Retrieved January 28, 2017. ^ a b Lila (August 31, 2011). "Venus Williams Leaves US Open. 10 Things You Should Know About Sjogren's Syndrome". Celebritydiagnosis.com. Retrieved January 1, 2012. ^ "Tennis: Venus Williams pulls out of ASB Classic". NZ Herald News. December 20, 2011. Retrieved January 1, 2012. ^ "Vika, Serena to Headline Day One" Archived August 22, 2016, at the Wayback Machine, FedCup, February 3, 2012. ^ "Miami Open Tennis Homepage – Miami Open". Miami Open. Archived from the original on February 2, 2013. Retrieved November 15, 2015. ^ "Volvo Cars Open". familycirclecup.com. Archived from the original on January 20, 2013. Retrieved November 15, 2015. ^ "Maria Sharapova ends Venus Williams's run". Stuff. Retrieved November 15, 2015. ^ "Venus Williams". USA Today. June 20, 2012. Retrieved June 25, 2012. ^ Brown, Oliver (June 25, 2012). "Venus Williams". The Daily Telegraph. London. Retrieved June 25, 2012. ^ "Venus Williams ousted in first round". ^ "Venus Williams to Skip Sofia Tournament of Champions" Archived March 4, 2016, at the Wayback Machine, Novinite, October 23, 2012. ^ "Williams Williams play for Bangalore Raptors in CTL". November 16, 2014. Archived from the original on November 18, 2014. ^ Nick McCarvel (May 27, 2015). "Venus Williams fined $3,000 for snubbing media after French Open loss". USA Today. ^ "Venus Issues Statement On WADA Hack". WTA. September 13, 2016. Retrieved September 14, 2016. ^ "Australian Open 2017: Serena Williams beats Venus Williams to set Grand Slam record". BBC Sport. January 28, 2017. Retrieved January 28, 2017. ^ "May Shot of the Month: Venus Williams". WTA. June 15, 2017. Retrieved June 18, 2017. ^ "Not again! Venus Williams sent packing by Timea Bacsinszky in French Open". Indian Express. June 5, 2017. Retrieved June 18, 2017. ^ "Sloane Stephens beats Venus Williams to reach U.S. Open final". USA Today. September 7, 2017. Retrieved October 1, 2017. ^ "Venus Williams qualifies for the WTA Finals". Women's Tennis Association. September 26, 2017. Retrieved October 1, 2017. ^ a b Williams, Venus. Wimbledon has sent me a message: I'm only a second-class champion Archived October 11, 2008, at the Wayback Machine, The Times, June 26, 2006. Retrieved July 6, 2008. ^ "Blair adds support for equal pay". BBC Sport. June 28, 2006. Retrieved November 26, 2011. ^ WTA Tour and UNESCO to promote gender equality Archived May 6, 2008, at the Wayback Machine, International Herald Tribune, November 11, 2006. Retrieved July 6, 2008. ^ Slezak, Carol. "We haven't heard last of Venus", Chicago Sun-Times, March 18, 2007. ^ Cingari, Jennifer (February 19, 2013). "ESPN Films and espnW Announce Nine for IX". Retrieved February 27, 2013. ^ "Air dates set for Nine for IX series". espnW.com. April 10, 2013. Retrieved April 14, 2013. ^ "Welcome to Dispatch Online". Dispatch.co.za. November 12, 2010. Archived from the original on April 28, 2009. Retrieved March 20, 2011. ^ "Williams sisters 'shocked' by shooting death of oldest sister – Sports". Findarticles.com. September 29, 2003. Archived from the original on August 5, 2009. Retrieved October 6, 2010. ^ "Venus Williams Aces Fashion Degree from Art Institute of Fort Lauderdale". Artinstitutes.edu. Archived from the original on June 5, 2008. Retrieved October 6, 2010. ^ Meredith B. Kile (April 2, 2018). "Venus Williams and boyfriend Nicholas Hammond share post-workout PDA". AOL. Retrieved April 4, 2018. ^ "Vegan Venus Williams talks about food and tennis". Mercury News. January 14, 2013. Retrieved April 14, 2013. ^ "Venus Williams receives her Bachelor of Science in Business Administration from IU East". Indiana University East. Retrieved August 15, 2016. ^ "Sister Act: Serena and Venus Williams". Hamptons Magazine. Retrieved August 26, 2011. ^ Service, Religion News (July 11, 2015). "Serena Williams's Secret Weapon: 'Jehovah God'" – via Huff Post. ^ LUCHINA FISHER (November 9, 2017). "Venus Williams deposed in fatal car crash case". ABC news. Retrieved March 2, 2018. ^ Cindy Boren (December 21, 2017). "Venus Williams, other driver will not be charged in fatal car crash". Washington Post. Retrieved March 2, 2018. ^ "Eleven website". Elevenbyvenus.com. September 6, 2010. Retrieved October 6, 2010. ^ "Venus Williams Scores at New York Fashion Week". September 13, 2012. ^ "#77 Venus Williams". Forbes Magazine. June 3, 2009. ^ "Venus Williams book on NYT Bestseller list". Usta.com. July 15, 2010. Retrieved October 6, 2010. ^ "40 Greatest Players of the Tennis Era (25–28)". Tennis Magazine. May 17, 2006. Archived from the original on October 9, 2008. Retrieved April 22, 2009. ^ "High time we appreciate Venus Williams". ESPN. September 13, 2010. Retrieved September 13, 2009. ^ William Lee Adams (June 22, 2011). "30 Legends of Women's Tennis: Past, Present and Future – Venus Williams". TIME. Retrieved August 19, 2011. ^ "DEAL WITH VENUS IN THE STARS FOR REEBOK". SportsBusiness Journal. May 22, 1995. Retrieved September 11, 2014. ^ "WHAT THEY'RE WEARING (AND HITTING WITH) AT THE U.S. OPEN". SportsBusiness Journal. August 28, 2000. Retrieved September 10, 2014. ^ "What they're wearing (and hitting with) at Wimbledon". SportsBusiness Journal. June 25, 2001. Retrieved September 10, 2014. ^ "Venus rallies to win longest Wimbledon final". MSNBC. July 3, 2005. Retrieved May 17, 2011. ^ a b "A Trio of Favorites at Wimbledon". MSNBC. June 19, 2008. Retrieved May 17, 2011. ^ "Venus Williams Defeats Sister Serena, Taking Fifth Wimbledon Title". Fox News. July 5, 2008. Archived from the original on November 3, 2012. Retrieved May 17, 2011. ^ "Venus sets record with 129-mph serve; Serena sails". SI.com. August 27, 2007. Retrieved June 6, 2012. ^ "Venus serves up a record". Tvnz.co.nz. August 28, 2007. Archived from the original on June 13, 2011. Retrieved May 17, 2011. ^ a b Christopher Clarey, 1997 "U.S. OPEN: A Phenomenal Final; Hingus (sic) and Williams Show Improvement With Every Match",The New York Times, September 7, 1997. Retrieved July 30, 2009. ^ "Venus Returns to Wimbledon Last Four", WTA, July 5, 2016. Edmondson, Jacqueline (2005). Venus and Serena Williams: A Biography. Greenwood Publishing Group. ISBN 978-0-313-33165-7. Williams, Venus; Williams, Serena; Beard, Hilary (2005). Venus and Serena: Serving from the Hip: 10 Rules For Living, Loving and Winning. Houghton Mifflin Harcourt. 133pp. ISBN 978-0-618-57653-1. Fafat, Aria (2018). Once Upon a Fishbowl - The Story of a Blue Fish. Singapore: Walking Stick Publication. 256 pp. ISBN 978-9811188176. 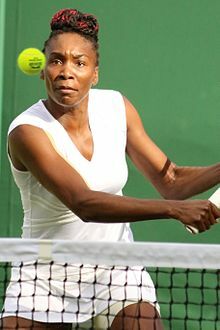 Venus Williams appears as the fish, "Neptuna Gilliams", in the novelization of Serena Williams' life, as lived by a blue-finned fish, overcoming "fishism" and gender discrimination in the fictional ocean country of "United Shoals of Americlam" to become the greatest marine player of the game of "Bubble Ball. ".